If you create a topic, you will (logically) and automatically be set to “watching” it. 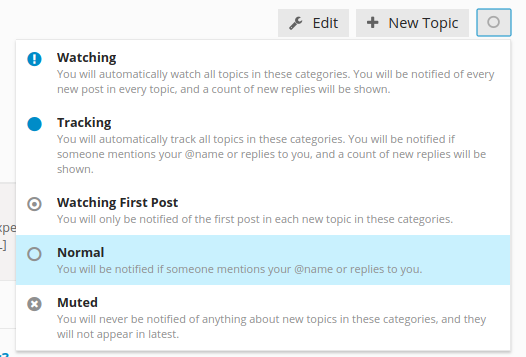 If you engage in a topic (e.g., reply to or “like” a post) you will automatically be set to “tracking” it. Want to keep up with MULTIPLE Categories? 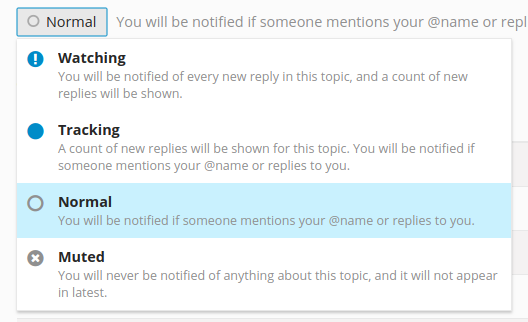 If you’d like to keep up with multiple categories, here’s the (fast) way to establish your notification settings. Go to your preferences/categories page (found by clicking your Avatar, the , then “categories” on the left under “notifications”). Hint: Since there are over 750 categories, it can be easier to simply place your curser in the form field and begin typing the name of the category of interest and the system will begin to auto-suggest for you. In the image just below, I’ve searched for “mob” to find the “Mobile County” category. If you want to search by state, simply use the two-letter postal abbreviation (e.g., “tx”). If you were a member of a particular Group on the old site, you remain a “member” of the new Category bearing the same name. In other words, you’re a member of the same old “groups” you were in before, they’re just not called that anymore. In short, what you want to do on the new site is to set your notification settings to watching a Category, then you’ll be notified of ANY activity within that Category. If anyone replies to any of your posts, by default, you will get a notification (ie, a colored dot appears on your avatar). If you’re not online, you’ll get an email.